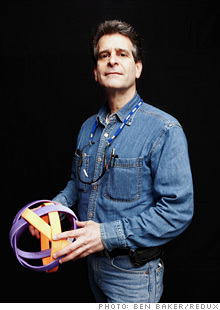 (Fortune Magazine) -- Dean Kamen isn't scared of failure. He is, after all, the inventor of one of the most famous flops (so far) of the 21st century: the Segway. Kamen positioned his electric scooter, which made its debut in 2001, as an alternative to cars that would transform the way people got around cities and towns. Investors, including Kleiner Perkins, Credit Suisse, and Kamen himself, spent more than $100 million to commercialize the machine. But it proved to be too expensive -- and too impractical -- for the mass market. Undaunted by the Segway debacle, Kamen has continued to churn out inventions and ideas that he claims will transform life for millions of people. 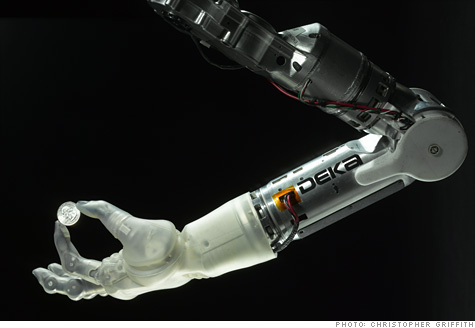 One of his latest creations, the DEKA Arm, revolutionizes artificial limbs: Using the latest crop of low-power computer chips, solid-state accelerometers, and high-energy batteries, Kamen developed a bionic arm for the Department of Defense that gives injured soldiers unprecedented motor control. "It's astounding to watch what can happen when you give these veterans something more than a plastic tube with a hook," Kamen says. Another contraption, a Stirling engine, makes electricity from cow dung, grass clippings, and other waste; eventually Kamen wants to install small Stirling engines in cars, scooters, and even water-purification systems for the developing world. Kamen, 59, can afford to be an idealist. In addition to his more quixotic pursuits, he has a highly lucrative day job producing devices for the medical industry. When he was 20 years old, Kamen invented a pump to deliver drugs to children suffering from cancer. The device, the AutoSyringe, was later reconfigured to serve a larger population: diabetics. Kamen figured out a way to deliver a precise dose of insulin exactly when patients need it. He sold the technology to Baxter International in a deal that made him millions. Other Kamen inventions have been acquired or licensed by Johnson & Johnson (JNJ, Fortune 500) and Davol. "I need those day jobs to fund my fantasies: supplying clean water and power to the world," he says. For all his commercial successes, Kamen remains an unabashed risk-taker. At DEKA Research, Kamen's invention factory in Manchester, N.H., he encourages his 300 or so engineers to shoot for the moon, whether they are working on commercial projects or more altruistic endeavors. At DEKA, failure is never punished. That's not to say Kamen doesn't learn from his mistakes. He also knows the importance of finding ways to make his inventions affordable for the masses. Indeed, the Segway wasn't a bad invention, but it failed as an innovation because it didn't bring about broad change. So to prevent his water-purification system from becoming the next Segway, Kamen is angling for some high-profile help. As part of his day job as an inventor-for-hire, Kamen developed a new-fangled soda fountain for Coca-Cola (KO, Fortune 500) and, in the process, started talking up the Slingshot, a vapor-compression water distiller that can turn sludge into drinkable water. Kamen's hope is that Coke might deploy the Slingshot alongside the various bottles and cans of the drinks it distributes around the world daily. He's also in initial talks with global pharmaceutical companies. "If you go to any village in the world, there are a couple of things you are going to find there: cigarettes, cellphones, and Coca-Cola," Kamen says. Kamen refrains from hyping the Slingshot or promising it will change the world -- language that he and others applied to the Segway. He remains enthusiastic about solving the world's biggest challenges: education, clean water, energy, and transportation. Only now he seems to understand that change takes time -- and a group effort. "Wilbur and Orville flew," Kamen says. "It took another 50 years before flying was mainstream." Put another way: The airplane was a great invention, but it took a combination of investment, technology, and time to turn air travel into an innovation. Luckily for Kamen, he has all those things -- and he's not afraid to fly close to the sun.